Routeplanners have always been somewhat magical in my eyes. Finding the quickest route from A to B in a graph of thousands of points and connections. I have tried to imagine how to approach such as problem. I have even come up with several solutions that I think might help to implement a performant system for unveiling the fasted itinerary between two points in the graph. The other day, while preparing for the Quiz on SQL and PL/SQL that Alex and I will do during ODTUG 2006 in two weeks time, I got hooked again on this same challenge. This time, the challenge translated to: write a SQL query that will find the quickest path between two points. The starting situation is the graph depicted above. This is the graphical representation of the points and connections. 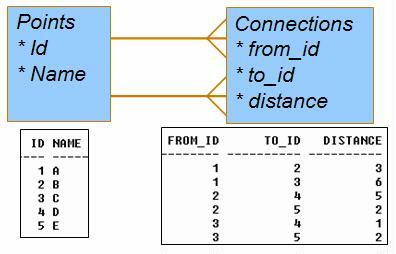 The same information is held in two tables: POINTS and CONNECTIONS. The question I would like to answer with a SQL query is: what is the shortest route – in terms of distance – from A to D. Of course with this simple graph we can easily tell ourselves by merely glancing at the graph. It is from A to C to D, a total distance of 7. But can a query give me the same answer? This view contains all connections. Note: I have assumed a directed graph where a connection from A to B does not necessarily mean there is also a connection from B to A. It would be simple to include those reverse connections as well, for example by extending the view definition with a UNION ALL and the same query with the from_id and to_id switched in the WHERE clause. This query will return all routes starting at A , including the ones that do not end at D. Note that NOCYCLE was added to prevent routes from circling endlessly through the graph. Suppose that A connects to C connects to B connects back to A – a very real possibility. In that case, without the NOCYCLE, we would have blown up the query. Since in this query all routes have to start at A, the expression CONNECT_BY_ROOT from_point is a little overdone, as it will always return 'A'. However, to make the query as generic as possible, I have used CONNECT_BY_ROOT from_point to return for each record the value of from_point in the first step of the route. We need to filter the above query result on only the routes that end at D. Subsequently, we need to order them by route_cost, returning the shortest route first. The latter is achieved using a simple PL/SQL function that calculates the distance based on the route_cose expression, simply by performing a little piece of Dynamic SQL. Note: this trick of turning the value from a SYS_CONNNECT_BY_PATH expression into a calculated value is described in Mastering Oracle PL/SQL: Practical Solutions by Connor McDonald, Chaim Katz, Christopher Beck, Joel R. Kallman, David C. Knox. thereby getting at our most secret data! So clearly the quickest way to get from A to D is through C with a total distance of 7. So going from A to B to E to D results in the quicket route. I haven't got a clue as to the performance of this query with larger numbers of points and connections. I would expect we should do anything we can to only start routes at meaningful points and try to stop investigating a route as soon as we know it goes nowhere. Well, that is for later. We got a reference to this article on the SQL Server discussion forum: http://forums.microsoft.com/MSDN/ShowPost.aspx?PostID=800277&SiteID=1. I doubt however this will work in SQL Server. How does your algorithm scale? I am very impressed about what via SQL can be done. Even Lucas Example is an easy one it could be an idea for using it in an application. I see always an area of practical use without the demand of Oracle Spatial. Ever looked at the network data model that is supported by oracle Spatial Option? Lucas…although I think what you’ve done here is quite impressive, Oracle10g already has this functionality (and quite a bit more) and it’s called Oracle Spatial. In fact, Orace10g Spatial has actual multimodal route planning as well as complex network (graph) analysis. Check out http://www.oracle.com/technology/products/spatial/pdf/10gr2_collateral/spatial_twp_ntwrkdatamod_10gr2_0512.pdff for more. Again, your work is pretty fantastic, but you may find that you are in fact trying to reinvent the wheel. 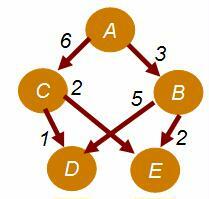 The most famous algorithm to solve this problem is developed by Dijkstra. The length of ABEG is 5. This is the shortest path so far. From B we can also branch to H. But 1+5>5, that path is to long, no matter what it does after point H. So we can stop here. Let’s take the ADG now. ADG is length 3, it’s less than 5 so our new shortest path is 3. 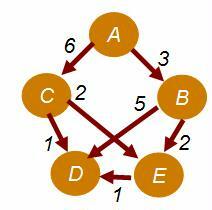 When we take the branch AC it’s 3, so we can stop immediately and conclude the shortest path is 3.